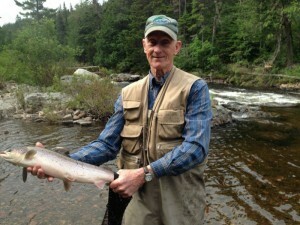 Alan Munn has been guiding on the Miramichi River in New Brunswick, Canada, and catching trophy Atlantic Salmon for his clients for more years than he cares to remember. I have had the privilege, and the good fortune, to fish with him the last three seasons at Rocky Brook Camp and the photo below is just one of many wonderful Atlantic Salmon that Alan has helped me bring to the net. 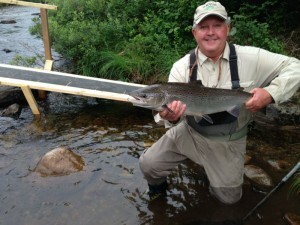 Alan is a very soft spoken Canadian; but if you listen carefully he will teach you so much about these remarkable fish. Atlantic Salmon are quite difficult to catch and some even call them “The Fish of a Thousand Casts!” These fish come up the river from the Atlantic Ocean to spawn and they really have no interest in eating. In fact, from the time they enter the river in early June until after they spawn and return to the sea the following April when the ice goes out they will loose 40-50% of their body weight. The Green Machine, the Black Bug and Bomber dry fly and some of Alan’s fly patterns that when used with his fly fishing techniques can entice these fish to take the fly. I am ashamed to admit that it was not until this trip to the Miramichi River that I learned Alan’s last name even after all the many hours we have spent on the river together. I am so grateful that I have had the opportunity to become friends with is kind, quiet man and I cannot thank him enough for all the fly fishing knowledge that he has been willing to share with me. 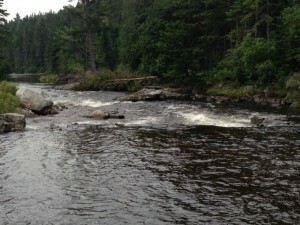 I truly hope that we are able enjoy each others company on the Miramichi River in the years to come.